In an outline of the G20’s financial agenda next year, investment financing and debt reduction would feature most prominently, says Russia. This was stressed by the Russian Deputy Finance Minister Sergei Storchak in Moscow on Thursday. “The idea is simple – consider what could be done to prevent debt crises in the future and find new ways for the effective use of loans,” Storchak said. Russia took over the G20 presidency on December 1. The Deputy Finance Minister said the G20 nations will focus on macroeconomic policy and financial markets and address ways to restore economic growth. Russian G20 Sherpa, Ksenia Yudaeva, said investment-driven growth would underpin Russia’s presidency. “The subject of investment driven growth will run through our entire presidency,” she said. Russia has been reiterating that without debt cuts there could be no economic growth. Russian Finance Minister Anton Siluanov earlier said the world’s developed nations should not abandon their budget consolidation and debt reduction plans. The first meeting of G20 Finance Ministers and central bank heads will take place in Moscow on February 15-16. 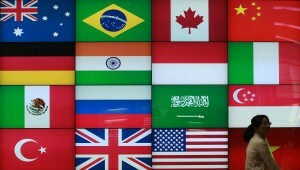 The Group of Twenty (G20) is a forum of the world’s largest economies consisting of 19 countries and the European Union. G20 members, namely Argentina, Australia, Brazil, Britain, Germany, India, Indonesia, Italy, Canada, China, Mexico, Saudi Arabia, the United States, Turkey, France, South Africa, South Korea, Japan, Russia and the EU, account for 90 per cent of the global GDP and 80 per cent of world trade. The northwestern Russian city of St. Petersburg will host a G20 summit in September 2013.